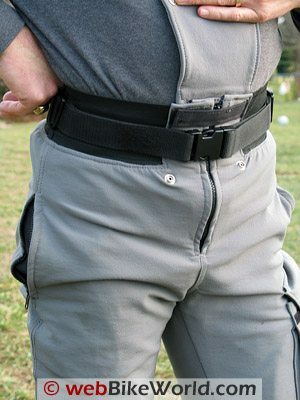 High quality pants offer good protection and are useful in many different environments. My goal was to find a pair of pants with a high level of protection throughout the garment. The pants also had to be practical to wear even in the warm, humid weather that is typical here in the mid-Atlantic during the dog days of summer. 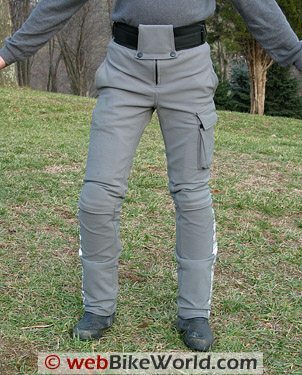 My cold weather problem has been solved with Gerbing’s Ultimate Suit, so I was interested in covering the other three seasons. Once again, finding a manufacturer that makes pants to fit my tall slender build would prove to be very frustrating. 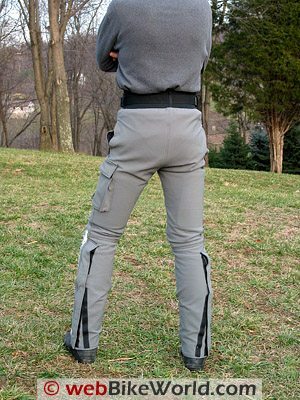 My street pants have a 32″ waist with a 36″ length (81.6 cm x 91.4 cm), and there are only a very few manufacturers who make riding apparel that comes close to my measurements. Also, the typical “long” lengths only start with a waist size of 34″ (86.4 cm) or larger. I also find myself questioning the use of the term “long” in most cases.Adding another 1-2″ (25-50 mm) or so doesn’t constitute a “long” in my book. Why they can’t add at least, say, 4″ (102 mm) and make the pant leg adjustable is beyond me. This would enable truly tall riders to buy their products. I would be more than willing to pay the additional $$ for an extra long pair of their pants. With too much time on my hands this past spring because of a non-riding related arm injury, I spent a good portion of my idle hours exploring the websites of the various motorcycle clothing manufacturers. Low and behold, next to none offered anything that came anywhere close to my size. So, while surfing the ‘net one day I happened across a thread of some riders extolling the virtues of some Kevlar gear they had purchased from a company named Motoport. Kevlar — isn’t that what they use to make bullet proof vests? “Let’s check this stuff out”, I thought. It seems that Motoport started manufacturing motorcycling apparel in Germany 41 years ago under the name of Difi, which is still a brand of riding gear sold in Europe, but interestingly enough does not appear to be made with Kevlar. The company branched out into the world market under the name Motoport and is now concentrating on the US market under their new name Cycleport. Cycleport’s claim to fame is the use of Kevlar in the majority of their clothing. Their website proclaims that “Kevlar is the strongest fiber known to man. Kevlar is made by DuPont and for apparel use comes in a thread form. In a pure weave, Kevlar does not stretch and is not suitable for use in motorcycle apparel where abrasion is important. Cycleport makes suits from a Kevlar/Cordura/Lycra weave. I recommend that anyone interested in learning about motorcycle clothing should spend some time reading through the Cycleport website. They have a great deal of information about their products and their construction, including fabrics and strengths as compared to other materials. According to their site, when Kevlar is woven in combination with other materials, the resulting fabric is far superior to leather in all ways and doesn’t degrade the way leather does. Nor is it going to melt, possibly into your skin, like some of the 100% synthetic garments can, should you have an “unintended get-off” with the resulting sliding that can occur. My phone call to Cycleport was answered by the owner himself, Wayne Boyer, who patiently answered all of my questions about their pants, the construction, lead time for manufacturing and ordering process. After asking about my intended use, he strongly suggested having at least one side leg pocket added to the pants (for an additional $19), which I’m glad I did, along with a pair of their waterproof-windproof-breathable Aero-Tex rain liners. Remember, I was looking for optimum protection that could be worn on a daily basis, so I opted to order the Cycleport Police Kevlar Pant. The Police Kevlar Pant is made from the same materials as their GP2 Kevlar Pant, which Cycleport claims are the only synthetic pants that are approved for road racing. Their pants come in an array of colors, but I chose to go with the grey. What are the differences between the Police Kevlar and the GP2 pants? The Police Kevlar Pant comes with a heavy duty 15” (38.2 cm) YKK zipper in the pant leg to be worn over the boot (although they can also make these pants to be tucked inside the boot on request). Each pant leg also has a 21” (50.8 cm) reflective stripe down the outside which I feel is vital for being visible from the side in the dark. The waist has a 4” (102mm) stretch panel that is designed to act as kidney belt, a 1 ½” (38mm) wide belt with a quick release buckle, a hook & loop strap that goes across the top of the YKK zipper (for reinforcement I guess) and then a flap, with rubber coated snaps, over top of all this to protect the fuel tank finish. Another reason I chose the Police Kevlar pants is because they were on sale for only $329 from their normal price of $479! Top that off with the fact that Cycleport pants are custom made right here in the old U.S. of A. at their plant in California, and they will make the necessary alterations at no charge to ensure a proper fit (unless they were given incorrect measurements), I figured how could I go wrong? Cycleport has standard sizes available for some of their products, but for a perfect fit many of the items are made to order. Their sizing instructions advise the customer to don a pair of jeans and sit on their bike. With both feet on the pegs and the wrinkles pulled out of the pant legs, mark the location of the knee caps on the pants and measure how much more length is needed in the pant leg. The pants are then mailed to Cycleport in California. What I ended up doing was sending them my Draggin’ jeans (see my review) with the knee armor in place along with the additional length needed (about 4”). I made an error about my boot size, resulting in a phone call from Cycleport to clarify my measurements. I call that good service. The pants arrived in the timeframe expected (I was in no hurry since I was unable to ride anyway). What struck me right away as I pulled them out of the box was their overall weight. They’re not as light as I thought, but I guess they’re not as heavy as a set of race leather pants either. I was also impressed with the construction — no loose threads and all of the stitching was neat and tidy. The pant legs consist of an upper and lower section sewn together above the knee with double stitched seams using nylon thread with a 100 lb. tear strength, resulting in over 2000 lbs. of seam strength as are all of the other vital seams. A zippered slash pocket is located on each hip and they’re nice and deep, once the lining is straightened out on the inside. I had the pleated side cargo pocket, which measures 9” (23cm) tall by 7.5” (19cm) wide, placed on the left leg so I could access it with my left hand while on the bike. While the opening is a bit tight, the fabric does stretch as I reach into the pocket and it secures with a hook and loop flap. Both the pants and the rain liners have a sport-type mesh liner similar to the type commonly used in motorcycle clothing or sports apparel to aid in breathability of the garment. Cycleport also claims that their Kevlar suits with Tri-Armor are the “world’s most protective motorcycle apparel”. It’s interesting to note that Cycleport advises that it isn’t necessary to remove the Tri-armor for cleaning — the entire garment can be thrown into the washer, cold water only, and hung to dry. Armor is provided in the knee/shin area, around 2/3 of the thighs and also in the hips. The hip armor is sewn in place, while the other sections are located in pockets and are removable. This does keep the armor where it’s needed, but it also makes the pants a bit rigid. Cycleport says that the armor is a bit stiff for the first 20 minutes or so the very first time the garment is worn, but after that break-in period, it’s supposed to conform to the rider’s body and becomes unnoticeable — that is, until it’s time to take the pants off or drop them low enough for a “nature break”, which can be very awkward. I must say the hook-and-loop materials used on the leg flaps are some of the strongest I’ve seen and will attach like a magnet to any similar nearby material, which adds to the difficulty of donning or removing the garment. So how do they perform? I wanted to report back after having worn these pants in as many different environments as possible and believe I have accomplished this. I’ve worn the pants in temperatures ranging from 30 F to 102F (-1 to 38 degrees C) in everything from dry heat to high humidity and even in the pouring rain. My feeling is that these have to be the most comfortable pants I’ve ever worn. All of my experience with the Police Kevlar pants was while riding either my ’99 BMW K1200LTC or ’06 Yamaha FJR 1300A (see my owner report), both of which have fairings: large and larger. I wouldn’t want to go on a hike through the woods wearing the pants, but then that’s not what they were designed for. Yes, they’re warm when the mercury climbs, but as long as I’m moving, it’s OK. When I was riding out west in the dry heat at around 100+ degrees F, I discovered that by pouring a little water in the pants pockets I could simulate a type of cooling. The also pants breathe well enough to keep comfortable and there’s nothing in the seat that bunches or digs into my posterior. Also, since the fabric is a stretch material, should the owner eat a bit too much at that roadside BBQ shack, the pants will accommodate the “expansion”. With the Aero-Tex liner installed, the pants are 100% waterproof during a “frog drowner” — which is more than I can say for my jacket. The liners are secured into the pants with a zipper around the waist and loops with snaps at the ankles. I’m still not sold on the idea of having the water barrier on the inside of a garment. I’ve been surprised on more than one occasion by a pop up shower which, with an internal liner, requires my stripping down to skivvies, zipping in the liner, then getting it back on before becoming drenched. And I’m supposed to do this along the roadside? It still makes more sense to me to have the waterproof cover on the outside. I’m not sure I agree with the claim that heated gear won’t be needed and all you have to do is wear some good-quality thermal underwear beneath the pants when the liner is installed. 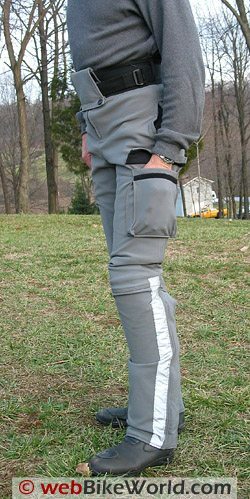 I tried this with a pair of polypropylene pants in 32 degrees F (0 degrees C) temps on my FJR1300 and my legs were getting chilly after the hour’s ride to work. Also, it was quite difficult to slip the pants on when wearing the polypropylene underwear; the material in the pants is too “grippy”. Except when it’s hot, I usually wear a pair of Coolmax tights underneath. I feel the Cycleport Police Kevlar Pants are an excellent product. I hope I never have the opportunity to test their construction, but if it does happen, I feel confident that the fabric will stand up to the task and the armor will stay exactly where it’s needed because of well how the pants fit. They’re snug, without binding or restriction in movement; they’re comfortable through a wide range of temperatures and they’re made to last. They can be a bit of a hassle to get in and out of at times, but well worth the effort in my book. The Cycleport Police Kevlar Pants are no more expensive than some “off the rack” riding gear, but are custom tailored to fit you perfectly. The only thing I would do differently if I had to do it again would to be to buy a pair of the Cycleport Aero-Tex waterproof over-pants rather than the waterproof liner. Colors: Black (other colors sometimes available) Made In: U.S.A.
From “J.T.” (September 2012): “I have been using this same product for about 2 years and am completely satisfied with it. As for problems with customer service I spent time on the telephone giving them all my measurements and the clothing came with correct sizes with no problems. I too have ridden this type of clothing in cold as well as hot weather. In the cold I can add the quilted jacket or the inner windproof rain jacket or both if it gets too cold. As for hot weather anything nearing 100 degrees F in leather would not be comfortable so it appears that those who purchase that type of clothing just don’t wear them when it gets that hot. I have ridden in the near 100 degree weather several times and like a previous person commented as lot as you keep moving it is ok. Personally I would not wear much of the clothing on the market today because of the damage that can be done to the skin when the clothing melts on a slide on the highway event. Editor’s Reply: I’ve heard the rumors that it’s possible for polyester textile clothing to melt during a slide, but I wonder if that is an urban legend, as I have a hard time believing it could really happen. Maybe I’m wrong, but I have never actually seen proof that fabric has melted enough to damage someone’s skin? From “J.B.S.”: “I have owned the Jacket and Pants combo and been through one season of riding with them. Excellent high quality product. I live in N.E. Ohio in a cooler climate. I rode through 95 Degree heat in the South for 3 12 Hours days. I feel if it would not been for the cooling capabilities of this suit I would not have made it.